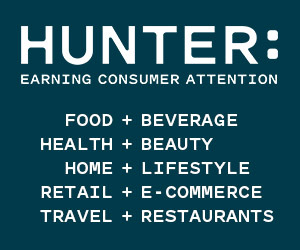 Agriculture | Beauty & Fashion | Entertainment | Environmental & PA | Financial & IR | Food & Beverage | Healthcare | Home Furnishings | Professional Svcs. | Sports | Technology | Travel & Economic Dev. The firms ranked above have satisfied the O'Dwyer ranking rules – supporting fee and employee totals with income tax and W-3 forms and providing a current account list. O'Dwyer's rankings should be regarded as an expression of our judgment of a firm's standing within the industry, and are not warranted to comply with any specific objective standards. 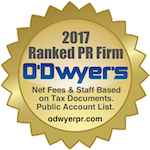 O'Dwyer's magazine, now in its 33rd year, is the #1 publication for PR and marketing communications pros. The magazine has been in full text on LexisNexis since 1989--the only PR magazine on LN. Each month, a different area of PR is examined. Issues include practice-area specific feature stories as well as profiles of PR firms with strengths in the focus area of the month. The agency profiles constitute the ideal starting point for companies beginning their search for PR counsel. Areas examined include technology, healthcare, financial, travel and fashion to name a few. Consult our editorial calendar for more information. The magazine focuses on the firms and individuals making news in PR as well as offering articles on industry trends. Our January issue contains our annual Buyer's Guide section, a de facto 60+ page directory devoted to the companies that supply the PR industry with products and services. For a comprehensive list of services such as media training, video production, celebrity talent, executive search, camera ready releases and much more, PR people refer to our Buyer's Guide. 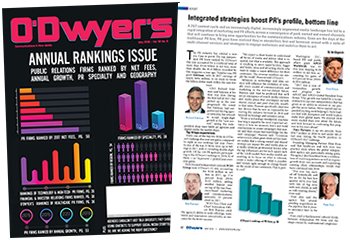 O'Dwyer's is the #1 source for researching outside PR counsel. 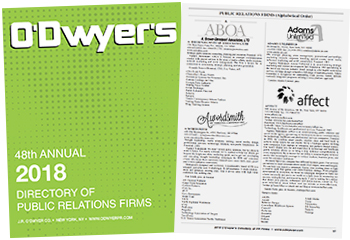 Add your firm to our online database and let O'Dwyer's help you to expand your PR firm locally, nationally and globally. O'Dwyer's is the only place you can look up a company (e.g., Microsoft, Nike, Starbucks) and determine its outside PR counsel.